France and Germany face this calculation: If Trump is unwilling to defend his closest allies, why stick with him? Better to go it alone than with bad company. Though I haven’t done the math, I’m pretty sure that “Trump” is one of the words I’ve repeated most often in my columns and on television over the last two years. Of course, there are many reasons for this. Donald Trump has upended global politics. His racist, sexist, xenophobic, anti-immigrant, anti-environmental ideas are a threat to democracy, to freedom of speech and to the very future of the planet. But while so many of our recent discussions about news and politics often end up being about the president, it’s quite possible to live without Trump. Consider the in-your-face reaction of Emmanuel Macron, the newly elected president of France, after Trump announced last week that the U.S. would withdraw from the Paris accord on climate change. 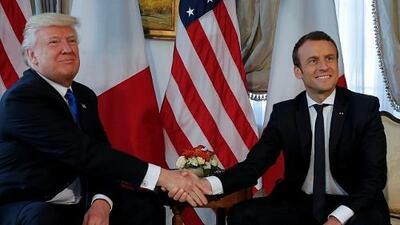 Macron invited American scientists and engineers to move to France to continue their climate change efforts. “There is no Plan B on climate because there is no planet B,” Macron said. Au revoir, Trump! Indeed, Trump is what happens when ignorance and power converge. While more than 190 countries honor the Paris accord, Trump’s rejectionism now puts the U.S. in the company of non-signers Nicaragua and Syria. We also recently learned that Trump isn’t a reliable partner on defense, either. Given Trump’s wavering at the recent NATO summit in Brussels, the question arises: If Vladimir Putin’s Russia ever attacked a NATO country, whose side would the president of the United States be on? The answer used to be obvious; these days it’s not. Merkel and Macron’s calculations come down to this: If Trump is unwilling to defend his closest allies, why stick with him? Better to go it alone than with bad company. Germany’s and France’s examples of independence and dignity? Standing up to the U.S. might hurt, but it can be done. Merkel and Macron can manage without Trump. But Fatima Avelica’s future is hostage to the president and his policies. Fatima, 14, told me recently in an interview that immigration authorities arrested her father moments before he dropped her off at school in Los Angeles. “He’s not a criminal; he’s just a dad,” she said. Fatima recorded everything on her phone, and the video went viral (watch it here: bit.ly/2rfxorf). Fatima and her three sisters, all American citizens, are now living in deep uncertainty. Their father, Romulo, was arrested in late February and is facing deportation. Meanwhile, the family has been left without a primary source of income. Other children across the country fear the same fate as Fatima. About 4.5 million minors in the U.S. have at least one undocumented parent. These children can’t separate their lives from Trump and his anti-immigrant rhetoric. What’s increasingly evident and worrisome is Trump’s isolation. This is a man who, just after midnight last Wednesday, posted that mysterious tweet ending with the word “covfefe.” It was a typo, surely. But nobody was there to correct the president, and it took six hours before the tweet was deleted. This is also a man who wants to withdraw from treaties that would at least set a baseline for a stable and safe future for our children’s children’s children. But Trump, like a regular schoolyard bully, cares about no one but himself.